The Kurilian Bobtail cat is a strong cat with a wild appearance, medium to large in size, brawny with strong substantial boning, but despite the Kurilian Bobtails looks they are very gentle. It is one of the thirteen natural breeds of cat recognized by TICA. They have excellent health and a very well balanced character with a trusting and outgoing personality. They adore their people and love to be caressed. They are very active and seek the highest point in the house to survey all that may be going on around them. The Kurilian Bobtail can be short haired or semi-long haired. The Kurilian Bobtail cat is a natural breed of cat tracing its origins to the Russian Island of Sakhalin and to the Kuril Islands, an archipelago of approximately 56 volcanic islands, stretching 700 miles between the Russian peninsula of Kamchatka and the Japanese island Hokkaido, separating the Sea of Okhotsk from the Pacific Ocean. It is documented in Russia that cats with short tails have been on the islands for at least 200 years and were brought back to central Russia in the middle of the 20th century by members of the military or scientists. Because of their natural instinct for hunting they are popular as a domesticated feline in Russia for their mousing abilities. The Kurilian Bobtail cat was accepted to Championship status by TICA in 2012. As you can see, these cats have survived in their natural environment and have actually thrived. They hunt in groups and are very comfortable in their natural environment. Many visitors to the Islands fell in love with these outgoing, friendly cats. 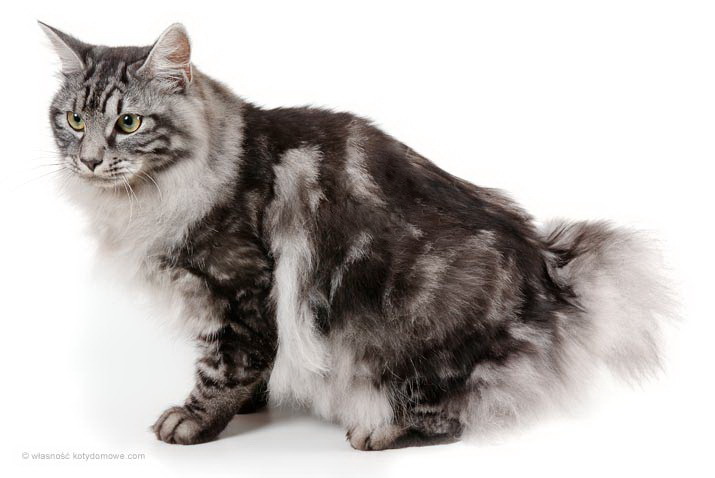 The character of the Kurilian Bobtail cat is independent, highly intelligent, clever, inquisitive, sociable, playful, trainable, absent of aggression and very gentle. They are devoted to their humans and when allowed are either on the lap of or sleeping in bed with their owners. They adapt well to other cats, children, dogs and other household pets. They are excellent jumpers and are inclined to survey their domain from the highest point available to them. Highly intelligent they need to be shown or told only once what they are allowed or what is forbidden, but it is up to the individual cat to carry out their own will according to their mood. The true phenomenon of the Kurilian Bobtail cat is the pom-pom appearance of their tail. Every Kurilian Bobtail cat has a unique tail structure giving each its own unique signature. It is impossible to find two identical tails on the Kurilian Bobtail cat and such a diversity of tails gives even more charm to the breed. The short, busy tails can be shaped like a whisk, a spiral, or a snag that consist of anywhere between 2-10 vertebrae kinked many times in various directions and with different degrees of articulation. The body is medium to large, compact and semi-cobby, with a broad chest. The head is large, a moderate modified wedge with rounded contours and wide at the cheekbone. Eyes are walnut shaped, oval on the top and rounded on the bottom. The ears are medium sized, triangular in shape, wide at the base and slope slightly forward. On first seeing, Kurilian Bobtail cat you may think that the cat is not particularly heavy, but upon lifting the cat it becomes apparent that these marvelous creatures are very solid and brawny. Mature males can weigh as much as 15 pounds, however females are generally smaller weighing between 8 and 11 pounds. The coat is soft and silky, generally non matting and pleasant to the touch. The Kurilian Bobtail cat comes in a variety of traditional colors in solid or tabby, and these colors with any amount of white on their body. Some of the most stunning Kurilian Bobtails cat also exhibit silver highlights.